Einstein once said that if you can’t explain something simply then you don’t understand it well enough yourself. Trying to explain the modern world to our children can be hard. Take the refugee crisis – it’s a complex topic about statehood, citizenship, war, conflict, ethnicity, prejudice…and more. 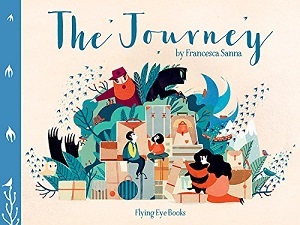 Francesca Sanna has boiled it down and made it simple – one journey, one perspective, one angle – one ordinary family. It’s a picture book that shows the reader, through the eyes of a child, the fears, difficulties, stresses, vulnerabilities and strokes of luck that are part of being a refugee. The author has herself travelled and lived in many countries, and interviewed migrants, and this is reflected in her illustrations, which, at the beginning of the book, give off hints of the Middle East and Asia in their depiction of plants and flowers, landscapes and buildings. Then Sanna shows pictures of animals and images from the land in which the family may end their journey, which are clearly more Western European – reindeer, fir trees, rabbits, foxes and wintry leaves. On the first pages, the family play happily at the seaside, before the dark hand of war stretches across the page. War is personified – it’s darkness but with encroaching fingers, which plucks away the father, and then threatens the rest of the family group. The mother’s friend talks of leaving, and the family pack and go, starting their treacherous journey. Throughout the journey there are elements of fear, again portrayed with darkness, or emphasised by size that obstructs or scares or intimidates. There is the darkness of the border with its huge wall, the huge guard with pointing finger, the trafficker both dark and large, yanking the family away from the darkness but into the next fearfulness – the crossing of the sea. Although there are these elements of fear, there isn’t the stereotypical ‘boo’ of a picture book to frighten young readers. Here, the fear is an implied emotion – an expression of the daunting obstacles that need to be overcome. And then there is Sanna’s portrayal of the overarching beauty of the mother, which dominates the story. She has exaggerated long dark flowing locks, which almost work as an extension of her arms – embracing the children in times of fear. Her hands are busy too. They also protect her children, or mother them – she reads them a book, packs, shushes them in times of danger, holds their hands, and uses them in a number of ways to perpetuate the journey – driving them in a car, or steering the handlebars of the bicycle. Until the end on the train, where they are on their way to the new land, and the mother’s hair is driven freely by the breeze, and her hands lie idle on the window, her eyes looking to the future. The portrayal throughout conveys her strength – the reader sees her tears only when the children are asleep. There is hope at the end, an uplifting cliff-hanger as the family’s story is, of course, just beginning. The book has been prepared beautifully – from the extraordinary artworks to the quality of the paper, the thought into the white space on the pages, and then again those pages of darkness where there is no white space. The small touches, such as the cat they leave behind, and the attractive bookcase, all help to detail the picture of a family. This is a highly accessible book for anyone wanting to understand forced migration. Highly recommended for all schools, all children, and also for anyone who appreciates great illustrations. You can buy it here.